Survation, on behalf of The Huffington Post, polled 1090 UK adults regarding their thoughts on the Shadow Chancellor, Ed Balls, on 12th September. Our recent poll found that voters appear generally more favourable towards Chancellor George Osborne than they are to Shadow Chancellor Ed Balls, with nearly 35% expressing a clear preference for Osborne as Chancellor over Balls, while less than a quarter expressed the opposite preference. We asked a variety of ‘Balls vs Osborne’ questions in which Balls also tended to fare worse than Osborne. More people would trust Osborne to fill in their tax return correctly and on time, manage their local bank branch, and believe he is the more likely to return a library book. Respondents also tended to believe Osborne is the better looking of the two, although 64% didn’t express a preference on the attractiveness of the two men vying to be the next Chancellor. The bad news continued for Balls and the Labour Party, with a third of respondents still blaming the last Labour government for the UK’s economic difficulties and even a quarter of 2010 Labour voters attributing the recent economic improvement to actions that Osborne has taken. 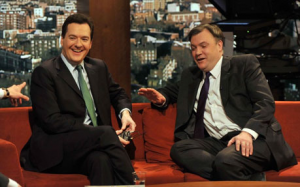 However, it was not all doom and gloom for Balls; respondents would rather go for a drink with him than Osborne, and he also appears more empathetic than Osborne, with respondents tending to believe that Balls cares more about the poor and improving pay and working conditions than Osborne. Follwing Balls’ speech at Labour Party conference, Survation, also on behalf of the Huffington Post, conducted a further poll of 1004 UK adults to gauge their reactions. In his address to the Labour Conference, the Shadow Chancellor announced that, should a Labour government be returned in 2015, every government minister would take an immediate 5% pay-cut and their pay would be frozen until the UK’s financial deficit is balanced. Respondents were asked whether they believed this policy announcement was a “gimmick” or whether they felt this would help focus a future Labour government on the task of getting the UK’s deficit down. Balls also announced that a future Labour government would cap the rise in child benefit at 1% per year, saving £400 million over the course of the next Parliament in order to reduce the UK’s deficit. Data tables for the Balls vs Osborne poll are available here. Data tables for the Ed Balls Reactions Poll are available here.